' Butterfly Spring Wreath - Sisters, What! Good morning! I'm Lisa Mabey, and I blog at Mabey She Made It, a simple sewing, crafts, and home decor blog with a classic feel. I'm so glad to be here sharing a little spring wreath with you with cute butterflies. I have a simple uncomplicated style, which makes creating projects easy to do. Follow along as we make this butterfly spring wreath! Adhere resin flowers to remaining two banner pieces using dimensional foam tape. Your pieces are finished! Cut three 1-1/2" x 2" pieces of pink paper, and adhere them to three banner pieces with dimensional tape. Cut your card stock into five 2" x 6" pieces, and punch two holes in the top of each piece with a hole punch to create banner pieces. Cut or punch butterflies from decorative paper, and curl wings around your finger to give them dimension. Adhere to two banner pieces over the pink strips. Adhere spring sticker or printed greeting to third pink strip. 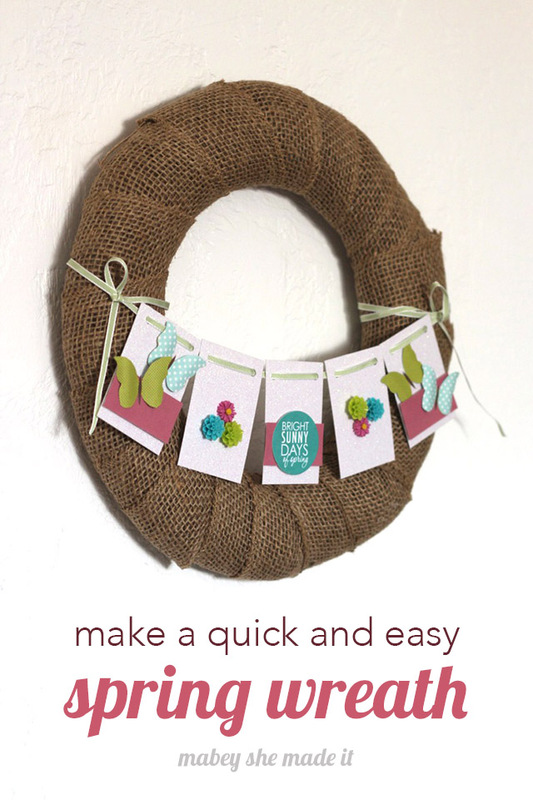 String 1/8" ribbon through punched holes, and tie it to your burlap wreath. 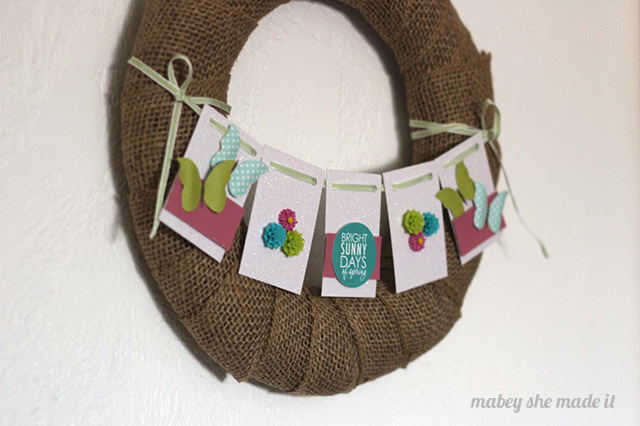 While the wreath is a great addition to any home for spring décor, with a little changing, It can be a perfect wreath for the holidays; simply by adding holiday cards. Shutterfly offers a variety of cards perfect for any occasion. How pretty! This would be great to hang inside so the paper doesn't get messed up in the rain. Thank you for sharing at Motivational Monday Link Party. I can't wait to see what you will share Sunday night again.